Chronic infection with hepatitis B virus (HBV) occurs in approximately 6% of the world's population and carriers of the virus are at risk for hepatocellular carcinoma and cirrhosis. Current treatment regimens, which include interferon-α and nucleoside/nucleotide analogs, are only partially effective and new treatment methods remain an important objective. Harnessing the RNA interference (RNAi) pathway to achieve post-transcriptional silencing of rogue genetic elements is an exciting avenue for development of novel therapeutic strategies. The specific and potent suppression of HBV gene expression and replication is an attractive option as a novel and effective approach for the treatment of chronic HBV infection. However, despite significant and rapid progress, existing RNAi technologies require further refinement before clinical applications can be realized. Here, we review current efforts aimed at improving the efficiency of anti-HBV RNAi-based delivery systems, at limiting the toxicities associated with RNAi modalities and at preventing reactivation of viral replication. We discuss the progress towards clinical implementation of anti-HBV RNAi therapies. Chronic hepatitis B virus (HBV) infection is an epidemic with approximately 387 million chronically infected carriers worldwide, and chronic infection carries a high risk for serious complications, such as cirrhosis and hepatocellular carcinoma [1, 2]. Current treatments for HBV infection include immunomodulators such as interferon-α (IFN-α) and nucleoside/nucleotide analogs, which are reverse transcriptase inhibitors, directly blocking viral replication. Although nucleoside and nucleotide analogs are well tolerated, the emergence of viral resistance remains a problem . Currently, the nucleoside/nucleotide analogs lamivudine (3TC), adefovir, entecovir and telbivudine are approved for use against HBV, with lamivudine being the most widely used. However, prolonged lamivudine monotherapy is often associated with the emergence of viral resistance to the drug . Although cross-resistance to other nucleoside/nucleotide analogs, such as entecavir, has been demonstrated, the preferred first line of therapy includes a combination of nucleoside/nucleotide analogs to limit the emergence of resistance (reviewed in ). IFN-α functions to augment the anti-HBV immune response and has been in widespread use for many years [6, 7]. Currently, unmodified and polyethylene glycol (PEG)-conjugated IFNs are licensed for therapy of HBV . However, some patients are poorly responsive to IFN-α therapy, and it can induce adverse side effects, such as hepatic injury . Moreover, IFN-α is often expensive and unavailable in resource-poor settings. There is a dire need for new therapies for HBV infection and the emergence of RNA interference (RNAi)-based technologies is an exciting new frontier in antiviral therapeutics. RNAi is a set of conserved eukaryotic pathways in which double-stranded RNAs (dsRNAs) trigger specific and powerful gene silencing [10, 11]. RNAi has an important role in regulating gene expression through the processing of long dsRNA precursors by the RNase III enzymes Drosha and Dicer into endogenous microRNAs (miRNAs) or short interfering RNAs (siRNAs). RNA 'guide strands' of around 22 nucleotides in length are each integrated into an Argonaute-containing RNA-induced silencing complex (RISC) and these target mRNAs for degradation or translational suppression [12, 13]. Considerable enthusiasm followed the initial discovery of RNAi in 1998  as it emerged that this pathway could be exploited for medical applications. Since then, RNAi technologies have developed rapidly with the aim of silencing rogue viral and host cell genes. This is especially the case for HBV, for which, so far, many studies have applied RNAi-based tools to inhibit viral replication in vivo and in vitro [14–18]. RNAi-based modalities differ from current therapies in that they can be used to block various different steps in the viral life cycle, from viral RNA replication intermediates to viral mRNAs. Importantly, different RNAi activators share similar pharmacological properties, allowing multiple RNAi-based drugs to be used together in combination treatments. Although similar to current multidrug cocktail regimes, RNAi combinations can target exclusive regions of the virus, thus avoiding problems associated with multi-drug sensitivities and toxicities. This makes RNAi-based therapies better suited to targeting rapidly evolving viral sequences, preventing the emergence of drug-resistant virus. Lastly, because RNAi-based drugs can be expressed from introduced genes, they offer the possibility for a sustained therapeutic response. The HBV genome has a relaxed circular DNA (rcDNA) structure that is partly double stranded (Figure 1a) [19, 20]. Having infected a hepatocyte, viral rcDNA is converted to covalently closed circular DNA (cccDNA), which serves as a template for the expression of viral genes and for the formation of the replicative intermediate pregenomic RNA [19–21]. This HBV replication intermediate exists naturally as a minichromosome and is analogous to the provirus of HIV-1-infected cells. Therefore, cccDNA ultimately controls the production of progeny viruses. One of the principal reasons for the poor efficacy of many antiviral treatment regimens has been the difficulty in eliminating episomal cccDNA from infected hepatocytes; it can reactivate HBV replication following withdrawal of treatment. A schematic of the hepatitis B virus genome structure, gene arrangement and expressed transcripts. (a) The partially double-stranded genome is shown associated with a viral capsid (gray hexagon). 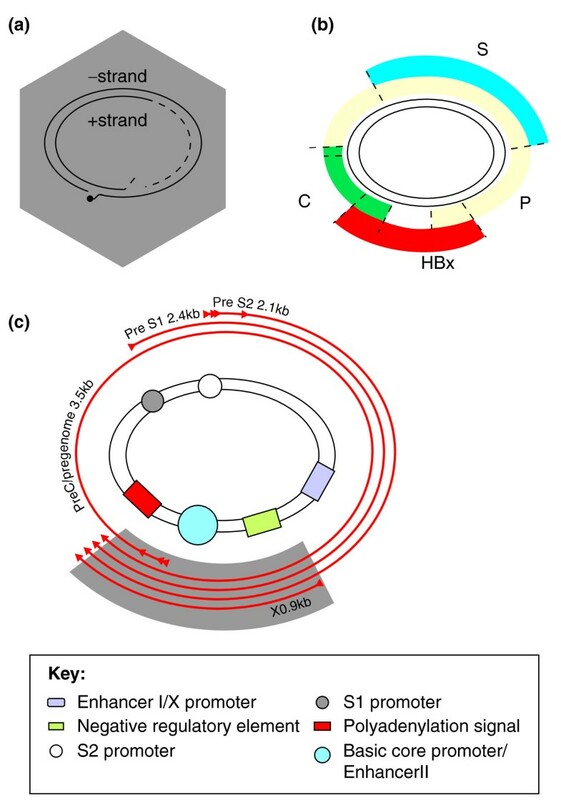 (b) The four viral open reading frames encoding the core (C), polymerase (P), surface (S) and hepatitis B virus X (HBx) proteins, colored to show how they partially or fully overlap each other. (c) Four major viral RNA species (outer arrows) are transcribed from the covalently closed circular DNA (cccDNA) template and terminate at a single polyadenylation signal. Targeting the X transcript of the viral genome (indicated by shaded gray region) ensures that a single RNAi modality inhibits all viral-produced RNAs, including the greater-than-genome-length pregenomic RNA. The entire viral genome is approximately 3,200 bases in length and is remarkably compact, encoding four open reading frames: core, polymerase, envelope (surface) and hepatitis B virus X protein (Figure 1b). All open reading frames partially overlap, collectively covering the entire genome. Viral regulatory elements, which control transcription and replication, are included within the protein-coding sequences. Although HBV replicates using an error-prone reverse transcriptase, its small, economically arranged genome limits sequence plasticity, making HBV a good target for RNAi-based therapeutic approaches, which rely on nucleic acid hybridization. Moreover, the virus produces four transcripts, initiated from four different promoters on the cccDNA but all terminating at a single polyadenylation site. Therefore, a single RNAi modality is theoretically capable of simultaneously targeting all four viral mRNAs as well as the pregenomic RNA template (Figure 1c). Ideally, anti-HBV sequences should be effective at low concentration (potent), stable, with no off-target non-specific silencing, have limited toxic immunostimulatory effects and be easily delivered in various prescribed doses. To achieve this, both expressed and synthetic RNAi activators have been used. Exogenous anti-HBV siRNAs are synthetic analogs of mature miRNA duplexes and activate RNAi at the stage of guide strand incorporation into RISC. Expressed RNAi activators are produced from exogenous genetic elements and mimic upstream RNAi intermediates that are recognized by Drosha and/or Dicer enzymes to produce active siRNAs. The chronic nature of HBV infection means that a sustained effect of anti-HBV agents is essential. Unmodified synthetic miRNA mimics generally have a short duration of efficacy and may be unsuited to treatment of persistent HBV infection. Sustained silencing with chemically modified siRNAs or expressed sequences may therefore be preferable. Chemical modification has been used to improve stability, silencing specificity and efficiency of the RNAi activators . Inclusion of 2'-O-methyl RNA and 2'-fluoro ribose moieties, use of locked nucleic acid siRNA derivatives and incorporation of phosphorothioate backbone modifications have been reported to improve siRNA efficacy [23–26]. Substitution of ribose with the six-carbon sugar altritol was also recently found to enhance stability and efficacy of siRNAs , and this chemical modification has shown promise in preclinical testing against HBV . Off-target effects caused by immunostimulation and activation of the Toll-like receptor proteins TLR3, TLR7 and TLR8 [29, 30] by siRNAs are important considerations in the development of RNAi-based HBV therapy. Avoidance of certain 'danger' motifs (such as 5'-GUCCUUCAA-3', 5'-UGUGU-3' and GU-rich sequences), ensuring that the length of siRNAs does not exceed approximately 27 bp, and various chemical modifications can be used to diminish immunostimulation . Unintended hybridization to host cellular sequences may be another complicating side effect of therapeutic siRNAs. The seed region of any potentially therapeutic guide sequence is likely to be complementary to non-targeted cellular mRNA and result in non-specific translational suppression. Interestingly, a 2'-O-methyl modification at nucleotide 2 from the 5' end has been found to attenuate this off-target silencing by siRNAs . Ensuring a guide strand selection bias in favor of the intended antisense sequence is also important to limit non-specific gene silencing. Weak interstrand bonding at the 5' end of the intended guide  and incorporating a 5'-O-methyl group on the terminal ribose of the sense strand  facilitate appropriate selection of guide strands by RISC. Collectively, these results show that chemical modifications are very useful to improve the safety profile and specificity of siRNAs, which are critical for development of anti-HBV RNAi-based therapy. Endoribonuclease-prepared siRNAs (esiRNAs) have been developed as interesting alternative RNAi activators [34, 35]. These silencing sequences are different from the new class of endogenous siRNAs (also termed esiRNAs) that have been found in Drosophila melanogaster  and oocytes of mice  in that the formation of endoribonuclease-prepared RNAs in vitro involves processing of large dsRNA by recombinant Dicer or Escherichia coli RNase III to produce a large pool of different siRNAs targeted to a specific viral sequence. When used against HBV, esiRNAs inhibited viral replication in culture and in vivo . An intriguing observation was that esiRNAs were capable of diminishing the concentration of viral cccDNA templates. Other researchers [39, 40] report similar findings and ascribe them to a feedback mechanism in which knockdown of reverse transcription of pregenomic RNA is effected by inhibition of HBV surface antigen production. However, inhibition of cccDNA production following RNAi-mediated HBV gene silencing has not been a constant observation , and non-specific effects as a cause for this observation need to be excluded [17, 42]. Good progress has been made in developing DNA expression cassettes that transcribe HBV-silencing sequences. Short hairpin RNA (shRNA) mimics of pre-miRNA or primary (pri-)miRNA shuttle sequences have typically been incorporated into expression cassettes. RNA polymerase III (Pol III) transcription regulatory elements have been used successfully but a concern has been that overproduction of anti-HBV shRNAs may disrupt endogenous miRNA function . Studies have recently shown that Pol II promoters can be used in highly effective monomeric or multimeric anti-HBV cassettes, which include features of naturally occurring miRNAs [44–46]. Research focus has therefore shifted towards the use of weaker Pol III promoters and the development of Pol II RNAi expression cassettes capable of tissue-specific and inducible expression of RNAi activators [45, 47]. DNA encoding anti-HBV RNAi activator sequences can be propagated conveniently in plasmids (pDNA), PCR amplicons and highly efficient hepatotropic recombinant viral vectors such as adenoviruses and adeno-associated viruses (AAVs). Although insertion of RNAi cassettes into pDNA is a routine procedure of molecular biology, safe and efficient use of pDNA is limited by plasmids' large size, and the presence of antibiotic resistance genes and immunostimulatory CpG motifs (reviewed in ). DNA minicircles, which can be generated by site-specific recombination of pDNA in bacterial cells, may overcome these problems. However, variable production efficiency and problems of contaminating pDNA currently limit their widespread use. Smaller PCR-generated linear expression cassettes, which include only essential components of the RNAi expression cassettes, have been used successfully as an alternative template for expression of anti-HBV RNAi effecters . Propagation of these sequences is convenient and incorporation of modifications such as stabilizing flanking hairpins  and phosphorothioate-modified oligonucleotide primers is easily achieved . Linear DNA traverses nucleopores efficiently  and may therefore improve delivery efficiency of RNAi expression cassettes. The development of any type of new therapy, including RNAi-based HBV therapy, typically involves a series of investigations that progresses from initial testing in cultured cells to rigorous analysis in animal models before clinical trials. A difficulty with research on HBV has been the limited availability of cell lines that are infectable with HBV, as well as the lack of a suitable small animal equivalent of human HBV infection. Surrogate models, which usually involve transfection of cells in culture or in vivo with HBV replication-competent plasmids, have therefore been used. Hydrodynamic injection of mice with HBV replication-competent plasmid is a convenient approach to simulate infection in vivo . However, this model has some drawbacks given that the procedure itself is hepatotoxic and viral replication is transient. HBV transgenic mice have been used as a more stringent model and HBV replication in these animals resembles the clinical condition of chronic HBV infection. Chimeric immunodeficient mice that are grafted with human hepatocytes have also been used as a murine model of viral replication [54, 55]. The livers of these mice, which are colonized with human hepatocytes, can be infected by HBV to enable testing of efficacy of antiviral agents. Larger animal models of HBV infection are available but are complicated by requirements for specialized housing and ethical issues. Examples include the woodchuck , tree shrew  and chimpanzee . As nucleic acids, synthetic and expressed RNAi activators are large negatively charged molecules and their delivery to cellular targets requires the use of vectors. Although progress has been made in this field, achieving safe and efficient transport of RNAi activators to cellular targets remains the most significant hurdle that needs to be overcome before the goal of RNAi-based HBV therapy is realized. The hepatotropism of HBV requires systemic administration of antiviral formulations. This is more complicated than topical administration of antivirals, which can be used to counter infections such as those caused by respiratory syncytial virus . An additional consideration is that to achieve sustained silencing of chronic HBV infection, repeated administration of vectors may be necessary, in which case avoidance of immunostimulation is important. Viral and non-viral vectors have both been used to deliver anti-HBV sequences in vivo. Although a variety of non-viral vectors can be used for this purpose, liposome nucleic acid complexes (lipoplexes) have been used most commonly. Lipoplexes are compatible with the use of modular assembly to tailor biological properties for specific applications. An example is the addition of galactose residues to non-targeting vectors to enable direct interaction with the liver-specific asialoglycoprotein receptor . Addition of 'stealth' molecules such as PEG can be used to improve vector stability and facilitate passive targeting of the liver. Modular lipoplexes were used successfully to deliver anti-HBV siRNAs in the stringent transgenic mouse model . Chemically modified anti-HBV siRNAs, encapsulated within lipids to form stable nucleic acid-lipid particles (SNALPs), silenced HBV replication in mice that had been subjected to hydrodynamic injection with an HBV replication-competent plasmid . Recently, rational design of cationic lipid components of SNALPs has been used to improve their efficiency . siRNA doses as low as 0.01 mg per kg body weight were capable of silencing an endogenous hepatic gene. This is potentially very useful for advancing HBV RNAi-based therapy; administration of low doses of the RNAi effecter diminishes the risk of unwanted side effects. Among recombinant viral vectors, adenoviruses and AAVs have been used to deliver anti-HBV expression cassettes in vivo. Infection of HBV transgenic mice with adenoviruses [14, 63] or AAVs [43, 64] carrying Pol II- or Pol III-driven anti-HBV shRNA cassettes inhibited viral replication significantly. Although adenoviruses are very effective hepatotropic vectors, there are concerns about their immunostimulatory effects after systemic administration. To attenuate immune responses against the vector and also to improve the anti-HBV effects of repeated administration, PEG modification of anti-HBV shRNA-expressing adenoviruses was used . Newer generation helper-dependent or 'gutless' adenoviruses, which lack viral protein-expressing sequences, have diminished immunostimulatory properties and can also achieve sustained silencing. A recent study has reported the use of anti-HBV helper-dependent adenoviruses . Only modest silencing was achieved, but this was ascribed to low efficacy of the selected anti-HBV expression cassette. The safety and low immunogenicity of recombinant AAVs have generated interest in this class of vector for delivery of anti-HBV RNAi sequences. Anti-HBV hepatotropic AAVs have been generated by combining the widely used AAV-2 serotype with the capsid of the liver-specific AAV-8 . To overcome diminished HBV silencing efficacy caused by an immune response to particular AAV serotypes, sequential administration of different vectors with different capsids was used to achieve sustained HBV silencing . The progress made in the field of RNAi-based HBV therapy has been impressive. Research on the topic has gained momentum, which will no doubt sustain the continued progress required to achieve the goal of developing HBV treatment suitable for clinical applications. Nevertheless, there are significant hurdles that need to be overcome. These include optimizing dose control, limiting off-target effects, improving delivery of RNAi effecters and demonstration of efficacy in suitable animal models before embarking on clinical evaluations. As the mechanisms responsible for off-target effects become better understood, so the approaches to diminish their significance have also advanced. New-generation antiviral expression cassettes and ingenious methods of chemical modification of synthetic siRNAs go a long way to avoiding unintended effects. Although promising viral and non-viral vectors have been developed for delivery of RNAi activators to hepatocytes, improvements in safety and efficacy remain an important objective before their eventual clinical application. Eliminating HBV cccDNA from infected hepatocytes is also an important consideration. EsiRNAs apparently caused a decrease in cccDNA in transfected hepatocytes in culture [38–40], but a recent study demonstrated that shRNA-mediated suppression did not alter intracellular cccDNA concentrations . The current phase of developing anti-HBV RNAi-based therapy is still at a preclinical stage. Most studies have been carried out in cultured cells and in murine models of the infection. Although useful, these models have their limitations. Detailed evaluation in animal models that simulate the human condition more closely is a priority, and outcomes from these studies will be useful to guide the development of clinical trials. Treatment regimens that use RNAi activators in combination with established licensed drugs will be interesting to assess and may reveal synergy of drug combinations. Despite difficulties with efficient delivery and limitation of off-target effects, and despite the limited availability of suitable animal models of HBV infection, advances in the development of RNAi-based HBV therapy are likely to continue to be rapid. Already, many other RNAi-based therapies have been tested in several early-stage clinical trials. Current indications are positive that RNAi-based drugs can be safely administered to humans and can specifically degrade target RNAs in vivo . Moreover, development of anti-HBV RNAi therapies benefits efforts to inhibit liver-specific therapeutic targets and specifically other liver infections, such as hepatitis C virus. Future research should see existing impediments surmounted and the prospects for advancing RNAi-based therapy for chronic HBV infection are exciting. Work in the authors' laboratory is supported by funding from the South African National Research Foundation (NRF GUN 68339 and 65495), ESASTAP, CANSA, South African Medical Research Council and the South African Poliomyelitis Research Foundation. MW and PA equally contributed towards drafting the manuscript. Both authors read and approved the final manuscript.